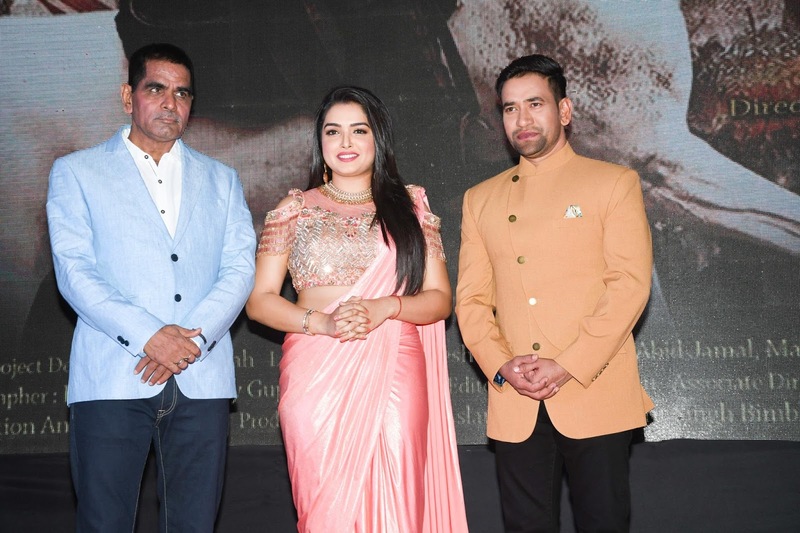 Home / Bollywood / Bollywood Vlogger / UNVEILING THE LOOK OF FILM "VEER YODDHA MAHABALI"
UNVEILING THE LOOK OF FILM "VEER YODDHA MAHABALI"
Cast- Dinesh Lal Yadao (Nirahuwa), Amrapali Dubey, Vanshikha Chaodhry , Deepak Bhatiya, Ayaz Khan, Sikandar Khan, Amrish Singh, Som Yadao, Rajiv Vashishth, Amjad Qureshi, Nagesh Mishra and Sushil Singh etc. Made in five different languages- Hindi- Telugu- Bhojpuri- Tamil- Bengali, Veer Yoddha Mahabali is the most expensive film.The film was shot in Mumbai & Rajasthan. 12th February, 2018 in Mumbai- Veer Yoddha Mahabali - A grand visual experience! Veer Yoddha Mahabali looks like a gorgeous picture postcard. From the look of the film, Veer Yoddha Mahabali 's magnum opus could potentially change the dynamics of cinema, with its seamless blend of good storytelling and marvellous, poetic visuals. The event saw the presence of RAVI KISSEN..
Director of the film Iqbal Baksh "Everyone associated with this film says it was their trust in the story line that made them back this film. One cannot compare themselves to the biggest film i.e. Baahubali in the history of films but Veer Yoddha Mahabali is our version to treat the audience with the best of everything from story, VFX, dialogues to costumes everything"
Producer of the film Ramesh Vyas "We have put additional efforts on VFX. If not better then Mahabali's execution in terms of story, VFX, dialogues to costumes everything is at par with Baahubali. Looking forward to the response from the audience"
Without revealing too much about the film & his character, Dinesh Lal Yadao (Nirahuwa) says that the film will be completed in 100 days in his warrior costumes. He adds that when the director of the film Iqbal Baksh narrated the story to him, he was thrilled. Visually breath-taking and technically superb, it’s a masterful stroke to use the best visual effects ever seen in filmmaking in a story laced with passion, power, and betrayal. Veer Yoddha Mahabali is stunning, magnificent, towering in scale and mounting, a humongous blitzkrieg of entertainment that will be tough to match in its mesmerizing mix of special effects and content. Banner- Lakshmi Ganpathy Films; Director- Iqbal Baksh & Producer- Ramesh Vyas; Presenter- Manmohan Ghuwalewala. CAST- Dinesh Lal Yadao (Nirahuwa), Amrapali Dubey, Vanshikha Chaodhry, Deepak Bhatiya, Ayaz Khan, Sikandar Khan, Amrish Singh, Som Yadao, Rajiv Vashishth, Amjad Qureshi, Nagesh Mishra and Sushil Singh etc. CREW- Co- Producer- Shankar Gupta (Dada); Project Designer- Sunny Shah; Legal Adviser- Nagesh Mishra; Music- Abid Jamal, Madhu Krishna; Lyrics- Kartik; Writer- Sanjay Bhardwaj (Lankesh); DOP- Dinesh R Patel; Action- Javed R Shaikh; Choreographer- Dilip Mistry, Ricky Gupta, Ram Devan; Editor- Kunal Prabhu; Associate Director- Ravikaant Gupta, Santosh Pal; Costume Designer- Praveen Jadhav; Art- Manish Shirke; VFX- Fiction Animation Studio; Production Controller- Aslam Sheikh, Gurpit Singh, Bimbh; Production Manager- Alokshri; Publicity Designer- Global Desk (Ajaye). ; Genre- Historical Period Action Drama; Languages- Hindi- Telugu- Bhojpuri- Tamil- Bengali; Media Consultant - Picture N Kraft. Veer Yoddha Mahabali is an Indian Fantasy epic film. This film will glorify the story of a brave warrior "Mahabali" - Dinesh Lal Yadav Nirahua who fights to maintain the pride of Virat Nagar.